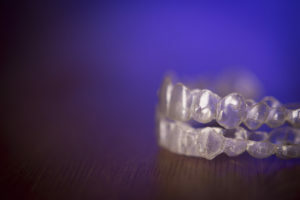 Did you know that an orthodontist and a dentist are not the same? Only a dentist can help with cavities, gum disease and more, while only an orthodontist can straighten your teeth in a certain way. 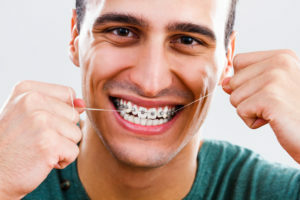 A patient’s time with braces is a time when cavities happen very quickly, because the teeth are harder to clean. To prevent cavities during your time with braces, it is vital that you continue to see a dentist. If you do happen to get a cavity, find out what that cavity treatment will look like! The American Dental Association recommends that every patient brush their teeth at least twice a day to avoid tooth decay. Brushing after every meal is even better for avoiding plaque buildup that leads to decay. Every patient should also floss their teeth at least once a day. Using fluoride toothpaste is best, because fluoride helps coat the teeth in a protective layer that prevents decay and keeps tooth enamel stronger. Patients can also benefit from mouthwash, as it can kill bacteria that would otherwise create plaque. However, these recommendations are for people that don’t have braces. Every single person—children, teens and adults—should follow these recommendations. Infants should not use fluoride or mouthwash, but their child toothpastes generally have safe amounts of fluoride in them. If you are a patient that is receiving orthodontic care via braces, you have to go the extra mile with your oral hygiene. That means more frequent brushing, more flossing and watching what you eat. 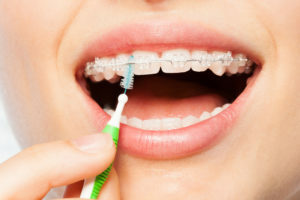 Braces can be tricky to clean. However, their design provides the best and quickest way for you to straighten your teeth, which is why traditional metal braces have been around for so many decades. 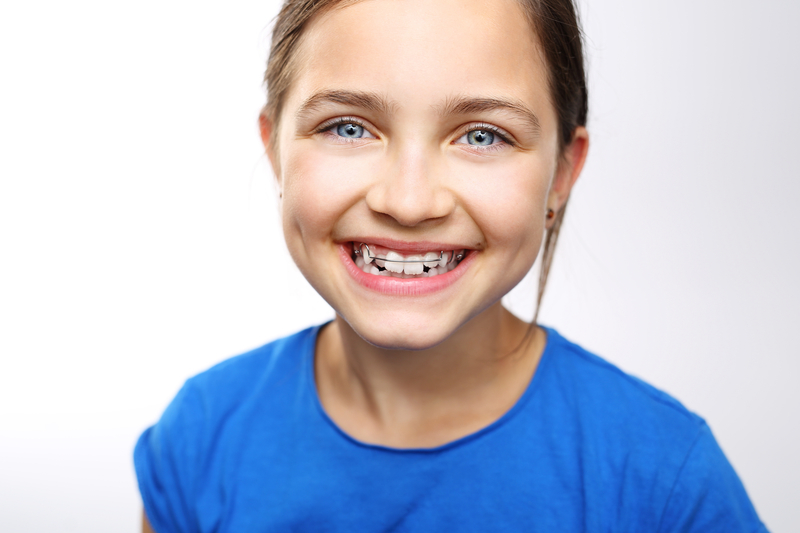 Metal braces, ceramic braces and lingual braces all have a brackets-and-wires design. 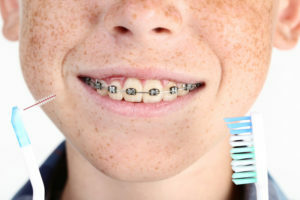 However, with braces, you must be meticulous with cleaning them or you will have food and plaque get stuck places. If you don’t unstick those substances, they will quickly erode your tooth enamel and cause decay around your appliances. This can happen on every tooth as well. Brush after every single meal. This reduces staining and bacteria buildup. Use a regular soft-bristled brush and brush down from the top, then up from the bottom. Brush in all different directions to dislodge food. Use a threadable floss or a floss threader. Both will require that you thread the floss through each space between your teeth. 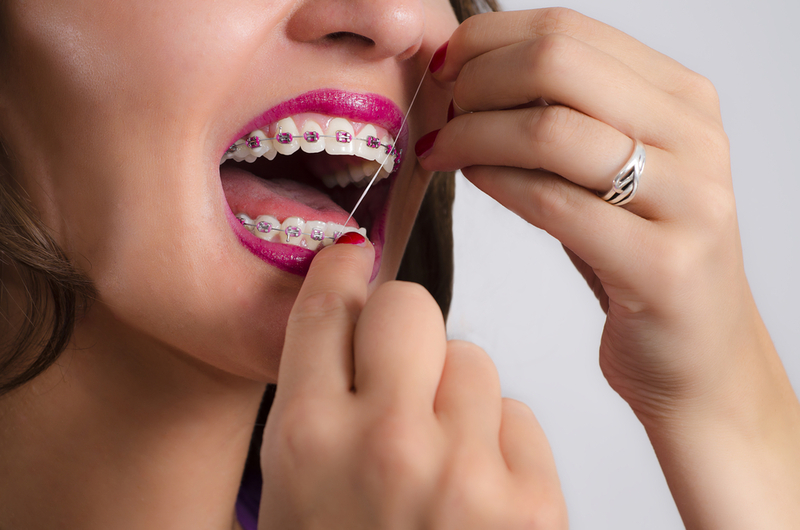 You will have to go under the wire to do this, and it will take slightly longer than normal flossing. This is one of the most important oral hygiene recommendations to follow! Use helpful tools. A proxabrush is a small braces brush that can help unstick foods. It looks like a tiny Christmas Tree brush. A waterpik is also helpful. This is a tool that helps blast away food particles with a stream of water. 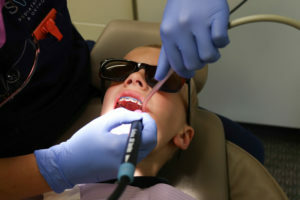 Many children and teens skip flossing or brushing here and there. Every time you skip on an oral hygiene habit, it increases your risk for tooth decay—or cavities—with braces. 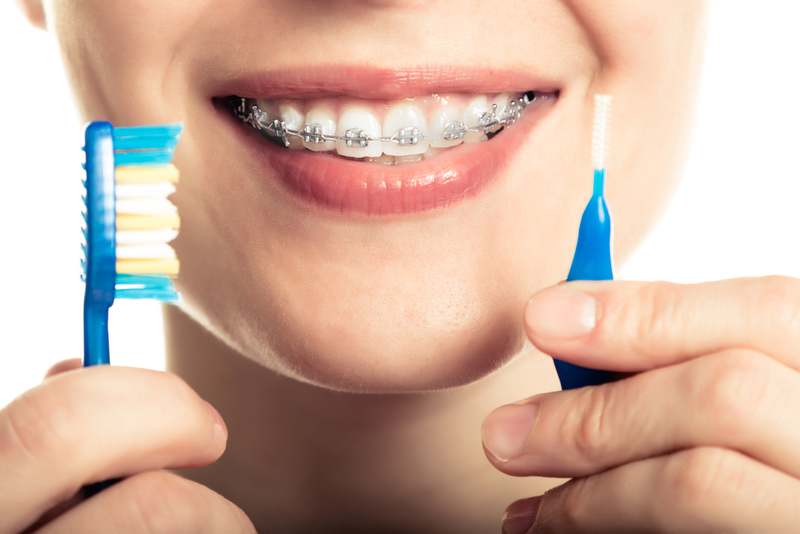 Your time with braces is one where you have to be super careful about your oral health. Most people picture their beautiful smile after getting their braces off, but they don’t think about cavities and tooth erosion. 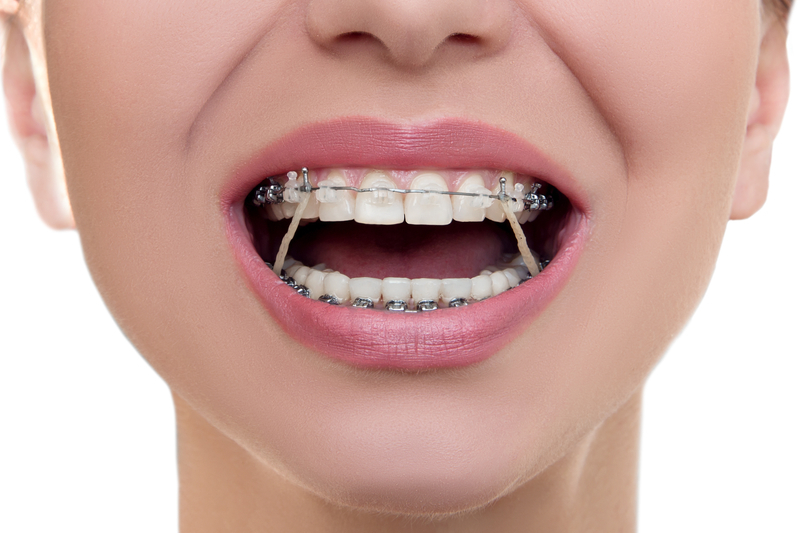 You can end up with tooth decay and parts of your teeth that have eroded due to your oral hygiene habits with braces. Nobody wants to spend 18-24 months perfecting their teeth only to be disappointed in their smile. That’s why oral hygiene is so important. Tooth decay happens rapidly, and it can happen where the brackets are bonded to your teeth and in-between your teeth because it is harder to floss. Normally, you would simply visit the dentist and have your cavity removed and filled. However, cavity treatment is a bit different with braces. 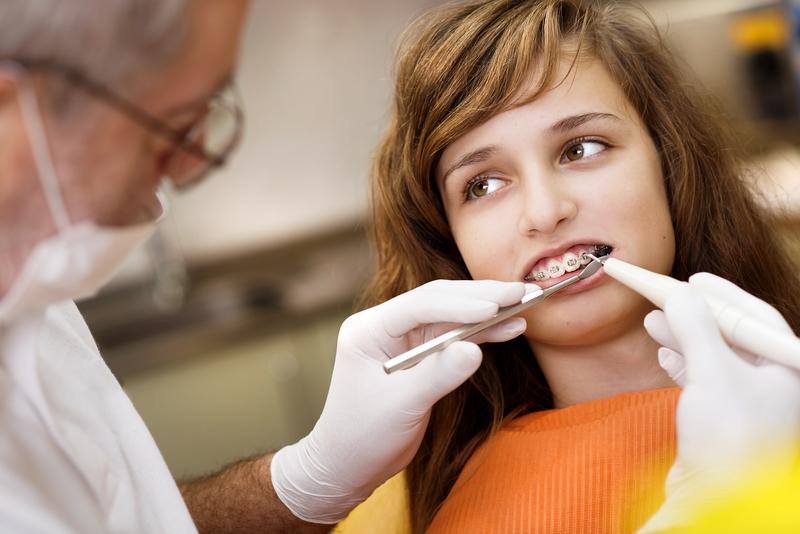 Cavity treatment is slightly harder if you have braces, but not impossible. Generally, decay happens between teeth cracks and around brackets and wires. If you have tooth decay that is in a tricky spot, we can remove your wire so that a dentist can provide you with a proper cavity treatment. You will have to have your appointments scheduled close together (dentist and orthodontist) so that you can get your cavity filled and your wire replaced. In severe cases of tooth decay, we may have to remove a bracket from the tooth if it interferes with the dental work that needs to be done. We only do this in certain cases, and we replace the missing part as soon as possible so your teeth don’t move. 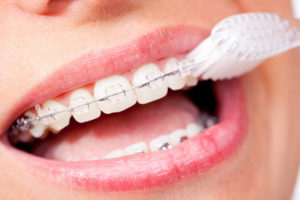 Cavity treatment—with taking out the tooth decay and filling it—is the same with braces as it is without, only you have to work around orthodontic appliances if you have braces. Always let us know if you have tooth sensitivity, sharp (and even mild) pain when chewing and if you have sensitivity to hot or cold foods. This signals that there may be a more severe cavity. The goal of every patient—old and young—is to avoid tooth decay altogether. If you do, you’ll never have to worry about cavity treatment with braces. If your decay is small and in a tricky spot, you may have to wait until your braces are off to receive your cavity treatment. That might make your cavity grow larger, which is something you don’t want. Always see the dentist to check your mouth for tooth decay before you receive orthodontic treatment. This can avoid many problems in the future. 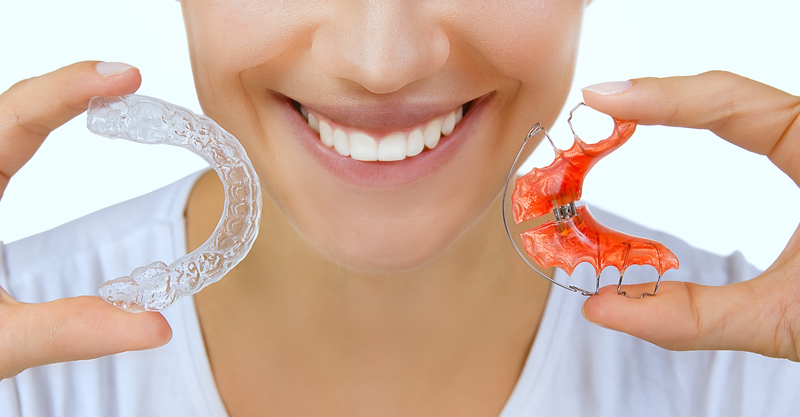 If you are prone to getting cavities or you have weak enamel, consider receiving Invisalign treatment instead of getting brackets and wires. 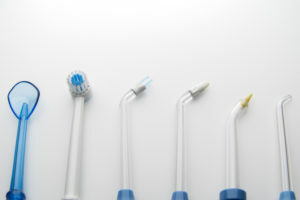 This will help you avoid problems with cavities and needing to get cavity treatment. If you have tooth pain or want to learn more about cavity treatment with braces, call Belmar Orthodontics today at (303) 225-9016!